There are forts, minor castles, mosques, wells called baories and chhatris or cenotaphs and much more to discover in the forgotten land of Mandawa. The eternal legacy of this small kingdom continues till date with its unique monument circuit. A gateway to Shekhawati kingdom, Mandawa served as a hometown for dominant merchant families who used to dwell in the artistic mansions, famously known as havelis. In fact, this quaint kingdom is the perfect base to experience the finest art and paintings projected on the outer walls as well as inside the monuments as an open art gallery. Found in the mid 18th century, the kingdom is dominated by an imposing castle, which is now well maintained as a heritage hotel. The 18th century Mandawa Fort rules the skyline of this Rajput town. Now converted into a heritage hotel, this fort becomes a dream stay for the tourists visiting Shekhawati. The famous Havelis of Mandawa defined the prosperity of this merchant town. These frescoed mansions served as the homes for these merchants, who were known for their penchants of comforts. These havelis were ornately decorated residences featuring meeting rooms or baithaks, complete with punkahs (cloth fans swung by pulling a cord) and other necessities that were considered luxurious during those times. By Railways - The closest train station to Mandawa is Jaipur. By Road – Mandawa enjoys strong road connectivity through Jaipur, Bikaner, Sikar or Churu. Hidden among the scrubby Aravalli Hills, Samode, on the outskirts of Shekhawati is notable for its impeccably restored eighteenth century palace, which is now known as a luxury heritage hotel, Samode Palace. This desert town is one enriching excursion from Mandawa. Famous for snacks and sweets, this town is identical to the most pictured camels on the unlimited expanse of golden hued deserts. 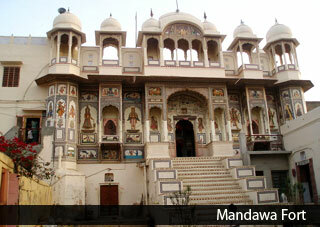 The city of victory is another great excursion from Mandawa. Located only 167 km away from Mandawa, this planned pink city is bestowed with many iconic monuments, palaces and forts to name a few. The vibrant murals on the havelis of Nawalgarh, a Poddar merchant dwelled town form a great reason to visit this quaint destination. The genuine charm of the town can be experienced during an illustrious visit to its 250 year old fort. Other landmark attractions of Nawalgarh include Aath Haveli, Hem Raj Kulwal Haveli, Bhagton-ki-Haveli and Khedwal Bhavan.